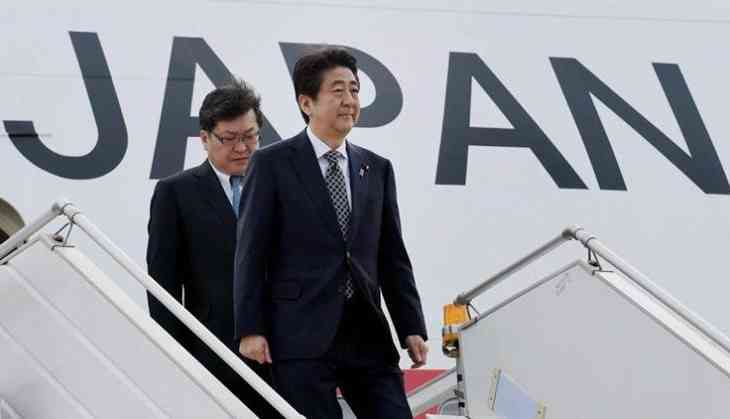 Concerned with the repeated provocations by North Korea that test fired another intercontinental ballistic missile on Friday, Japanese Prime Minister Shinzo Abe said that Tokyo will urge international community to build more pressure on North Korea as the threat to our nation is real. Abe said that the international community must raise the heat on North Korea over its latest ballistic missile launch. "As a result of their launches of ICBM-level missiles, this clearly shows the threat to our nation's safety is severe and real," Abe said. North Korea fired the missile shortly before midnight at Japan on Friday, just hours after the US and Japan moved to step up sanctions against Pyongyang, following its first ICBM test earlier this month. Chief Cabinet Secretary Yoshihide Suga said Japan "absolutely cannot tolerate" repeated provocations from North Korea and will make a severe protest against it. "There is no damage to any vessel or aircraft adding that the missile is believed to have fallen in Japan's exclusive economic zone,"CNN quoted Suga as stated. Immediately after the launch, Shinzo Abe called a meeting of Japan's National Security Council and said, "I have received information that North Korea once again conducted a missile firing,"
"We will immediately analyze information and do our utmost to protect the safety of the Japanese people." "We assess that this missile was an intercontinental ballistic missile," Pentagon spokesman Navy Captain Jeff Davis said, adding that the rocket travelled about 1,000 kilometres before splashing down in the Sea of Japan. On July 4th ,North Korea conducted its first successful test of a long-range intercontinental ballistic missile Hwasong-14, that it says can "reach anywhere in the world." An intercontinental ballistic missile reached a height of 2,802 kilometers (1741 miles), according to state broadcaster Korea Central Television (KCTV). After the July 4 launch, the United States conducted the successful test of its Terminal High Altitude Area Defense (THAAD) anti-missile system by shooting down an intermediate-range ballistic missile over the Pacific Ocean, thus increasing tensions between the United States and North Korea.